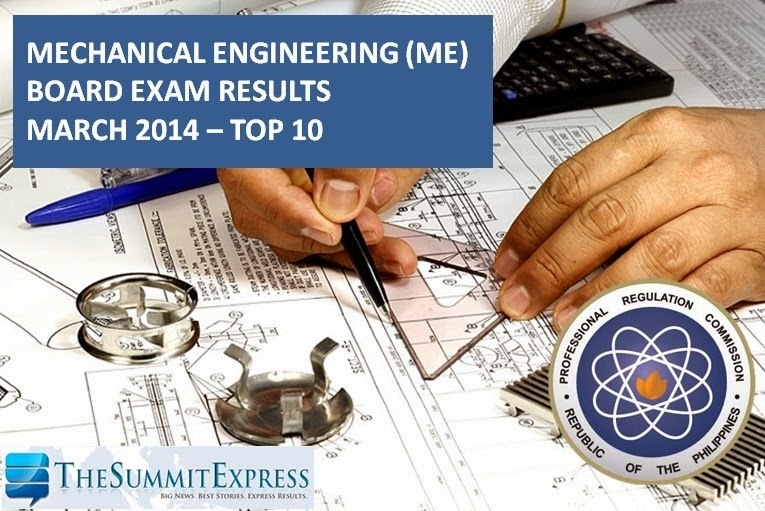 The Professional Regulation Commission (PRC) on Tuesday, March 25, 2014 released the full results of March 2014 Mechanical Engineer (ME) board exam. Leo Ventura Punongbayan from Mapua Institute of Technology (MIT)-Manila topped the board with 94.05 percent grade. University of the Philippines (UP)- Diliman and MIT-Manila graduates tied on second place with 93.15 average grade. Completing the top 10 list of passers are graduates of DLSU-Manila, MSU- General Santos City, University of Cebu, Cebu Institute of Technology and TUP-Manila.